NEW YORK (WABC) -- A suspect is under arrest for allegedly attacking a man with a tire iron at baggage claim at JFK Airport. Drivers tell Eyewitness News the tension is real. Honest, licensed livery drivers are at-odds with the unlicensed hustlers cutting-into their business. "They're taking the business, starting trouble here," a driver said. At times, it boils over. Police say one hustler attacked a livery driver with a tire iron after a dispute in Terminal 5. 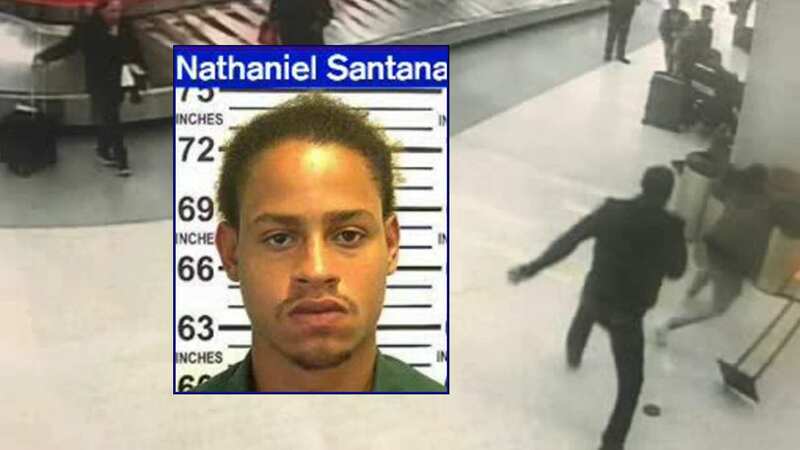 Police say Nathaniel Santana, 26, went on the attack inside terminal 5 by the baggage carousel and then ran off. He was caught a short time later along North Conduit Boulevard by Port Authority police. Santana is charged with assault and menacing, and is an ex-con with several prior arrests. "It is incredibly important for arriving passengers to understand that if they did not pre-arrange a ride, the only legal and safe method of transportation is a yellow taxi," the Taxi and Limousine Commission said in a statement. Eyewitness News saw very little security at Terminal 5 baggage claim Tuesday evening. Drivers say the TLC needs to do more. The victim, himself a licensed livery driver, survived the attack. He has been released from the hospital and is recovering at home.